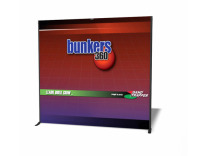 Tension Fabric Graphic Systems on our web site, has for years been the defining product in flexible wall systems in the trade show exhibit industry in that you can expand from a short 4' width out to 12' and up to 12' tall too! With easy and durable set up hardware that will last forever, you can easily transport The Wall Graphic System anywhere and quickly set up anywhere. 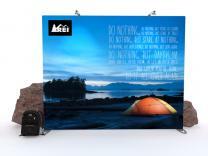 Also available with a molded shipping case with wheels for this and all other portable displays. 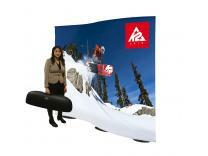 The Wall Graphic system and the Hybrid Inline System are tension fabric product that utilizes a pole pocket in both the top and bottom hems, which after The Wall frame has been threaded through the pockets on top and bottom and then stretched tight, which makes for a very efficient and sturdy structure utilizing tension fabric. 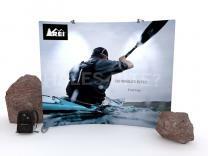 The Wall is fast and easy to set up and can be strung together to create longer runs of tension fabric.